Tickets for Star MegaDo 5 go on sale at noon CST today! Star MegaDo is a chartered Air Canada Airbus A321 flight from Toronto to Tucson, Arizona to San Francisco. You can find lots more information on the official MegaDo website. Like all Mega DOs (as in big party or get together) there will be lots of socializing and tours of a Rimowa factory, meeting executives from Air Canada and lots more. 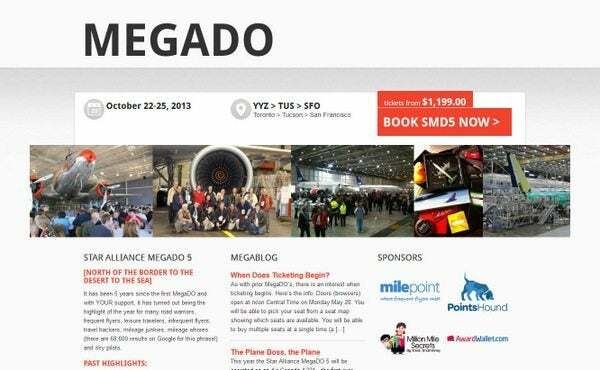 The Mega Do is from October 22nd to October 25th and you can find more information on this MilePoint thread. Million Mile Secrets is helping sponsor the event, but I won’t be able to attend, though I did attend StarMegaDo 3. And you also have to pay a discounted rate for the hotels and get yourself to and from Toronto and San Francisco. But the MegaDOs always sell out in advance, and within minutes.